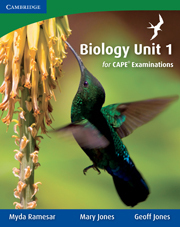 Biology Unit 2 for CAPE® Examinations has been developed to match the requirements of Unit 2 of the CAPE® Biology syllabus. 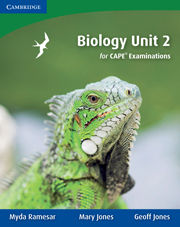 The course provides total coverage of Unit 2 of the CAPE® Biology syllabus, with worked examples to help students develop their problem-solving skills. Written by best-selling authors Mary and Geoff Jones and CAPE® Biology teacher and examiner Myda Ramesar, this textbook is in full-colour and is written in an accessible style.For more information and to order your Caribbean resources today, go to our How to order page.